We all know the classic fashion advice. Red and green should never be seen unless . . . you’re wearing a Mexican football shirt. Loud and proud and capable of selling in vast quantities, Mexico’s shirts are always unique and often a little bit weird. Mexico hosted the World Cup in 1970 and 1986 and when not welcoming the world to the Azteca Stadium, El Tri’s passionate supporters travel in great numbers to follow their side and will always be heard before they are seen. One of my favourite memories of attending the 2006 World Cup in Germany was meeting a Mariachi band walking through a train station in Nuremberg playing El Jarabe Tapatío (trust me, you know the tune!). You won’t find many friendlier fans or more feverish devotees to their country on Planet Football. Despite winning youth tournaments and Olympic gold medals, Mexico are among the great World Cup under-achievers having made the quarter-finals on just two occasions, both times as hosts in 1970 and 1986. In fact, the CONCACAF giants have exited at the second round stage in each of the last 6 tournaments dating back to USA 94. Mexican fans deserve better memories. After publishing a compilation of the World Cup’s finest football shirts, half a handful of readers claimed Mexican kits should have been included in the list. Prompted by the keen eye of others, here’s our tribute to the best of the always memorable Mexican shirts at the World Cup. 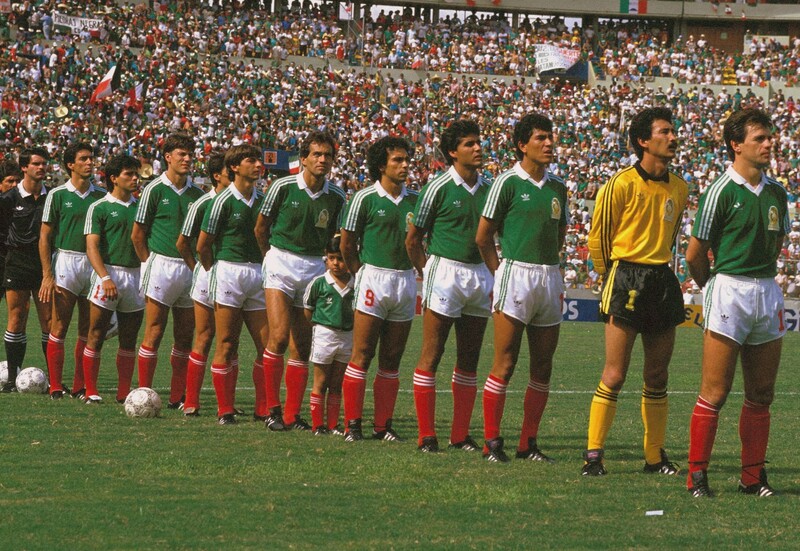 Up until the 1950s, Mexico wore maroon shirts with black or dark blue shorts before switching to the now famous green shirts, white shorts and red socks, inspired by the tricolor of the national flag. The 1978 World Cup was a highlight for football kit connoisseurs and to play their part, Levi Strauss provided the kits for Leonardo Cuellar, Hugo Sanchez (pictured above) and Co in what may have been the one and only time the Californians turned their hands to sportswear. I feel I owe Mexico a debt of gratitude for the colour and spectacle of the 1986 World Cup which ignited my love for the game. My first football memories aside from the 1986 Milk Cup Final (which historical research now assumes never actually took place) were of the Mexican Wave, the Hand of God and the fact that tournament mascot Pique was a sombrero wearing jalapeno pepper with a massive moustache. The hosts made the quarter-finals with Hugo Sanchez leading the line in these no-nonsense Adidas kits in the famous green, white and red. Nowadays, thanks to Pep Guardiola, goalkeepers who use their feet and can “play a bit” are celebrated as “sweeper keepers,” but back in the 1990s, we saw René Higuita, Jose Luis Chilavert and Mexico’s Jorge Campos as error-prone and missing the guacamole from their burrito. Colombian Higuita was behind bars and thus unfit to travel to USA ’94 so Campos conveniently replaced him as “football’s craziest ‘keeper” thanks in no small part to the colourful self-designed shirts he wore. Take a moment to imagine you are an international striker of some repute . . .
. . . You are a through on goal with only the keeper to beat . . .
. . . But before you can steady yourself for your shot at glory . . .
. . . Somebody throws a handful of luminous highlighter pens and fluorescent post-it notes at you and your big chance goes begging . . .
. . . Campos’ garish superhero costume has saved the day once again. As well as the distracting designs, there was method to Campos’ Mexican madness. No clown, he earned 130 international caps between the posts and scored 34 goals as a some-time striker at club-level. Here’s one that splits opinion. Nostalgia for the 90s has seen some crimes against fashion forgiven as supporters look to the uniformity of modern kits and yearn for something different. Mexican manufacturers ABA Sport weaved some tribal trickery into the fabric of these shirts. 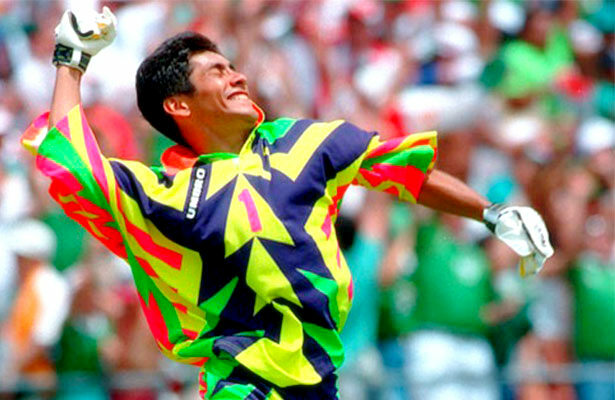 The result was truly original making Jorge Campos look shy and retiring. ABA took inspiration from Aztec art and were either onto something or on something depending on your view. Now regarded as an all-time classic and representative of the time, it’s a little like a Brutalist car-park that nobody can bring themselves to demolish despite how ugly it is. Adidas delivered the best shirts at Brazil 2014 with Mexico among the stand-out entries as the familiar green with red and white trim had a dramatic electric pulse sent through it. Having beaten Cameroon and Croatia and drawn with hosts Brazil, Mexico came just 2 minutes away from a first appearance at the quarter-finals in 28 years before a cruel final 6 minutes spelled elimination in Fortaleza. Wesley Sneijder’s 88th minute equaliser cancelled out Giovani Dos Santos’ before Klaas-Jan Huntelaar stopped Mexican hearts with an injury time penalty which Arjen Robben may have fallen over a little too easily for. 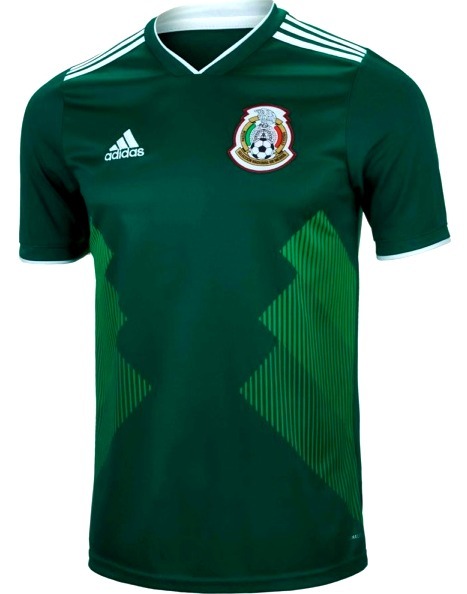 Adidas again have the honour of supplying Mexico with shirts for this summer’s competition. A darker shade of green and without the red of previous years, these are reminiscent of Liverpool kits from the early 90s in their use of the old “Adidas Equipment” styling. This is the summer for throwback designs but long-suffering El Tri will be hoping for a little more luck in their 16th tournament than in recent competitions, yet face a tough group featuring holders Germany, South Korea and Sweden. After a strong qualification campaign which saw them top the CONCACAF rankings, you never know, Colombian coach Juan Carlos Osorio’s men may just exceed expectations in Russia. 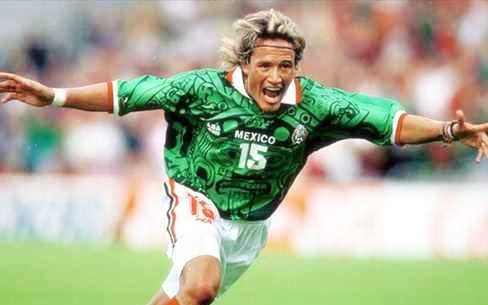 What’s your favourite Mexican World Cup kit? Where do you stand on the France 98 Aztec artwork? Classic kit or crime of fashion?